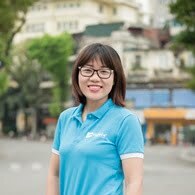 Once you arrive at the international airport and process your visa, you will meet your private driver so he can take you to your hotel in Hanoi to do the check-in. The rest of the day is free so you can relax or get to know this new country. This could be a good moment to visit some of the main colonial buildings in the city, such as the Opera Theatre or the Saint Joseph Cathedral. 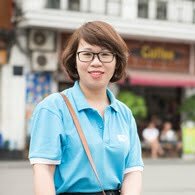 One of the iconic places of Hanoi is the Hoan Kiem lake, always crowded with Vietnamese residents, especially during the mornings, when you can see a lot of them practicing tai chi. 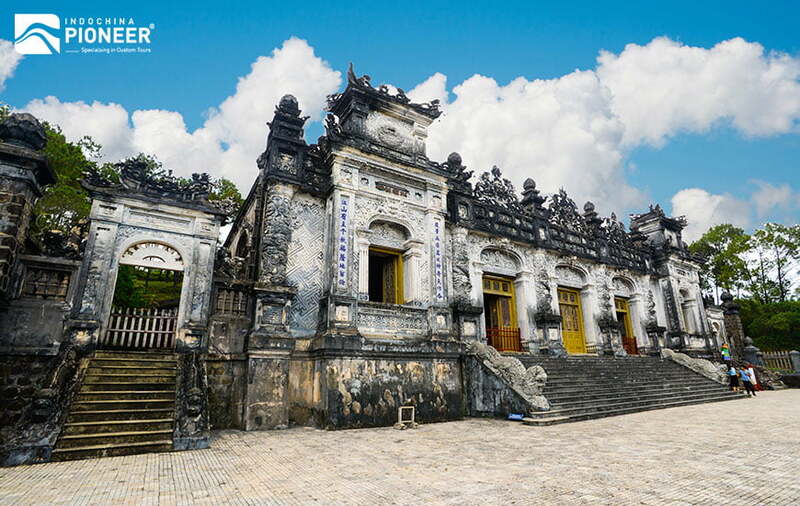 It is the center of Hanoi’s old quarter and there you can find – located in one of its northern islands – Ngoc Son temple, one of the most beautiful and sacred places in the city. You can get there by passing through The Huc, the red wooden bridge that leads you to the temple (“Sun Beam Bridge”). For those who prefer to visit museums, two should be mentioned: the one located in the former Hoa Lo prison – that kept many US war prisoners – and the History Museum, located in a beautiful building that once housed the Far East French School in Vietnam. This school was built between 1925 and 1932, and was one of the first buildings to unite Chinese and French architectural styles. 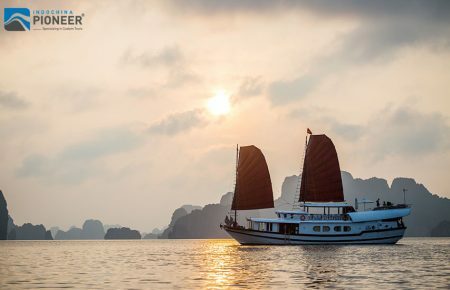 After breakfast in the hotel, you will start a city tour around Hanoi, probably one of the most exotic, elegant and vibrant capital cities in Asia. With its wide avenues flanked by trees, colonial buildings, ancient pagodas and pleasant lakes, this city often makes its visitors fall in love. You will start your day visiting the Ho Chi Minh Mausoleum. Ho Chi Minh is an historical figure who is considered the father of modern Vietnam. Erected in gray marble, this monument is one of the most sacred spots of the country and has become a place of pilgrimage for Vietnamese from all over the nation. 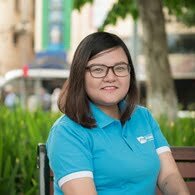 After that, you will see an authentic wood-stilted house and the One Pillar Pagoda (Chua Mot Cot), both located inside the Ho Chi Minh Complex. This symbolic pagoda was built using wood and in a lotus flower shape. It stands on a single column and despite it was constructed during the eleventh century, it has been rebuilt in 1954 after the French colonialists destroyed it. Later, you will head to the Tran Quoc pagoda, one of the most ancient shrines in Hanoi. Its red tower standing next to the Ho Tay lake makes it unique and very distinguishable. 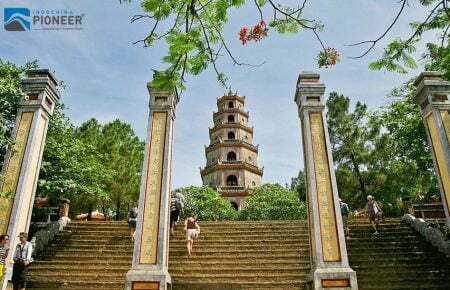 Following this pagoda, you will visit the extraordinary Temple of Literature (Van Mieu). This building is a perfect example of traditional Vietnamese architecture and consists of five well maintained courtyards that will make for a perfect break of Hanoi’s busy streets. The temple, once the first university of Vietnam, is consecrated to Confucius and destined to honor the memory of the wisest men and women of the country. 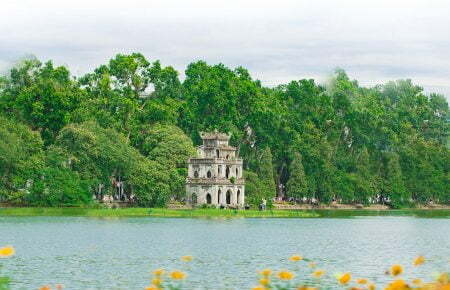 It was founded in 1070 and is now the most ancient – and probably the most attractive – historical monument in Hanoi. After lunch in a local restaurant, you will visit the Vietnam Ethnological Museum, located in a former French colonial building. 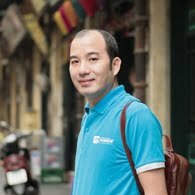 It will show you the extraordinary ethical fusion that makes Vietnam up. 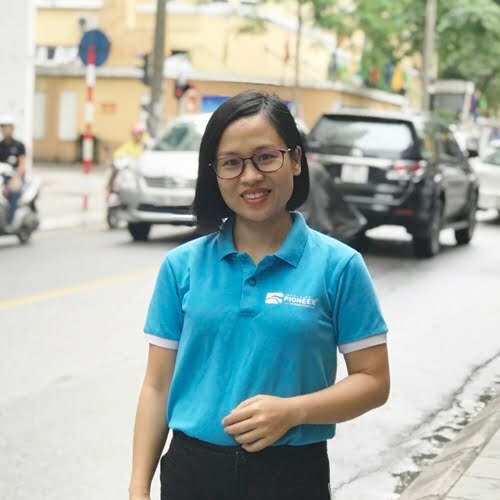 Following this, you will head to the busy Hoam Kien lake, heart of the ancient Hanoi, from where you will start exploring the city in a cycle ride that will take around 45 minutes. The narrow streets of the lively old quarter are known as the “36 streets”, because there were 36 different professions established there in the thirteenth century, next to the banks of the river, to satisfy all requests from the palace. By the Red River and the To Lich River, this area is filled with shops and stores, full of life and history, where you will breath the past while you listen to the calls from the vendors. 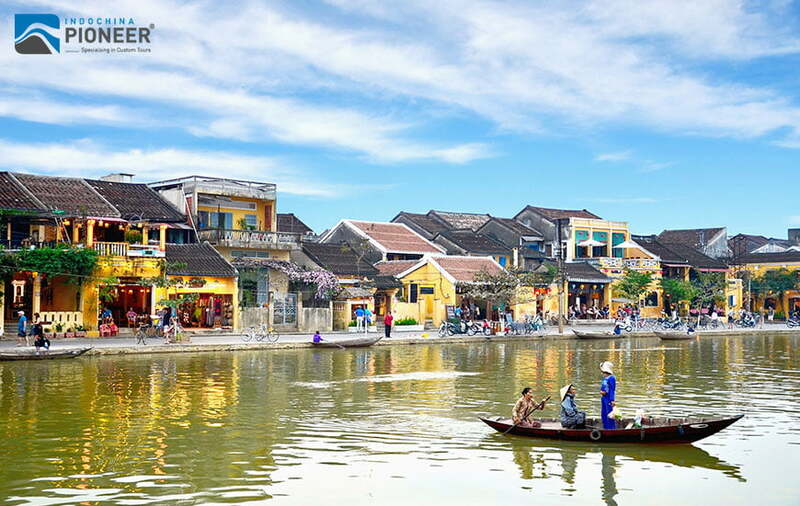 It is a paradise for handicraft lovers and a perfect place to learn about daily life in Vietnam. 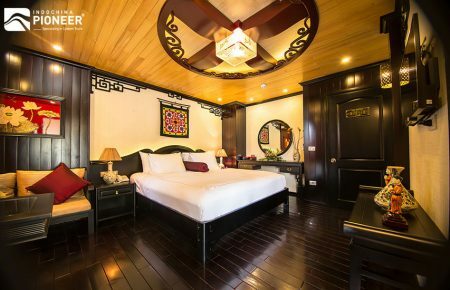 In the evening, you will be able to enjoy a traditional water puppet show in the Thang Long Theatre, after which you will go back to the hotel or will roam the city at your own pace. 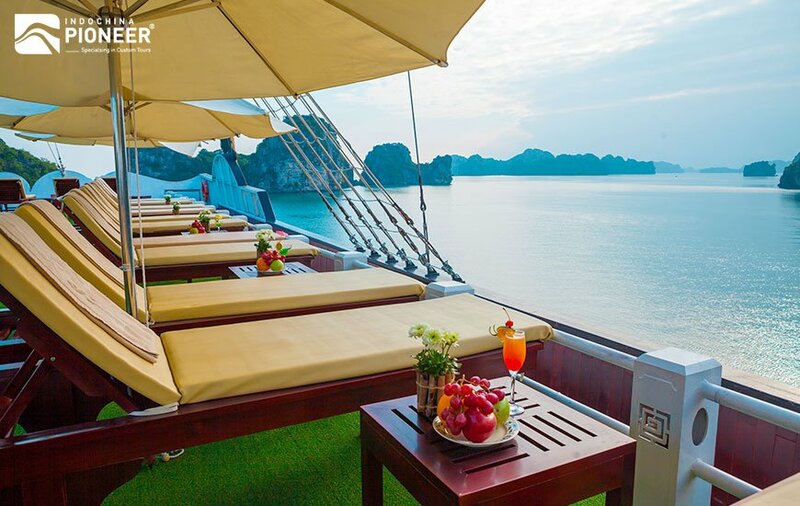 After breakfast in the hotel, at the appointed time you will start a 4-hour road trip towards the famous Halong bay. During the ride, you will be able to contemplate the beautiful scenery of the impressive Red River Delta, dotted with rice paddies and farms. Once you arrive, get on a nice boat where you will have lunch and get a cabin assigned. After lunch, you will leave the dock and go offshore to discover the many and astonishing limestone islands and islets that rise from the bay waters – as Dinh Huang, the incense pot. Surely this is the best way to get to know this magical and incomparable place. Listed as a World Heritage Site in 1994, some people describe this bay as splendorous, mysterious, enigmatic, evocative… but the truth is that we cannot describe it with words, as none can do justice to it. 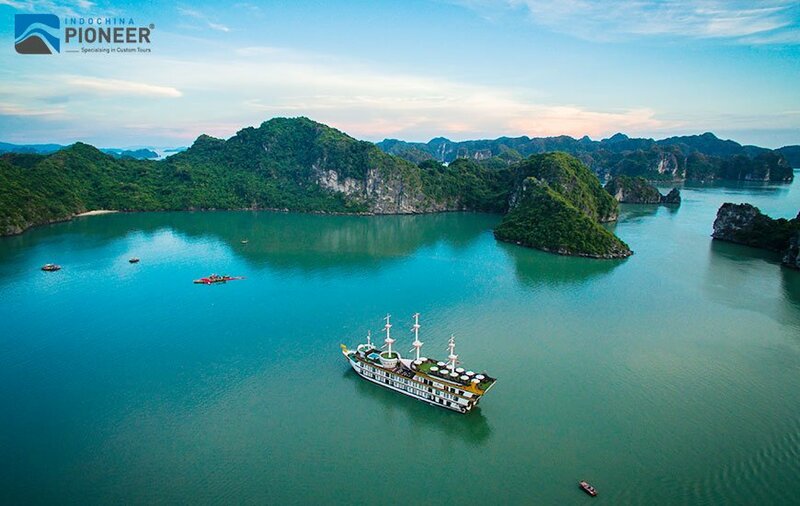 Sailing through these islands, you will reach the fruitful lands in the Red River Delta, where you will be able to observe the daily life of the villagers, who work in the paddy fields and farm with water buffaloes. Later, you will enjoy a special dinner on board while the sun is setting and the night is coming. After that, go to your cozy cabin to rest. After waking up, you will enjoy breakfast or brunch on board, as the bay reveals itself to us and offers an unforgettable experience. From this moment, you will have leisure time to relax until you go ashore. 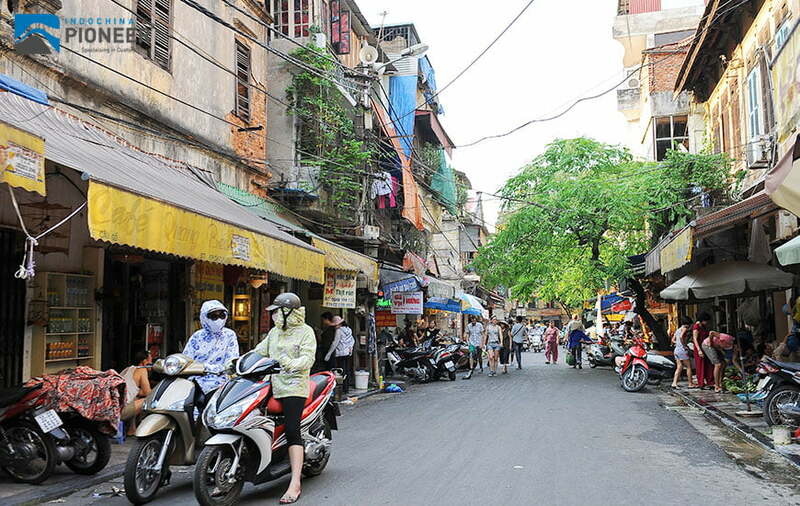 When you are on solid ground, you will get transferred to Hanoi’s airport to take a short flight to Da Nang. Upon arrival Da Nang Airport you will be picked up by your private guide and then driven towards the beautiful ancient town of Hoi An. Check in to your hotel room. Then evening is yours at leisure. After having breakfast in the hotel, you will start your day in the ancient town of Hoi An, a beautiful place that once was an important commercial port to where Chinese, Japanese and European merchants used to come to trade their goods. 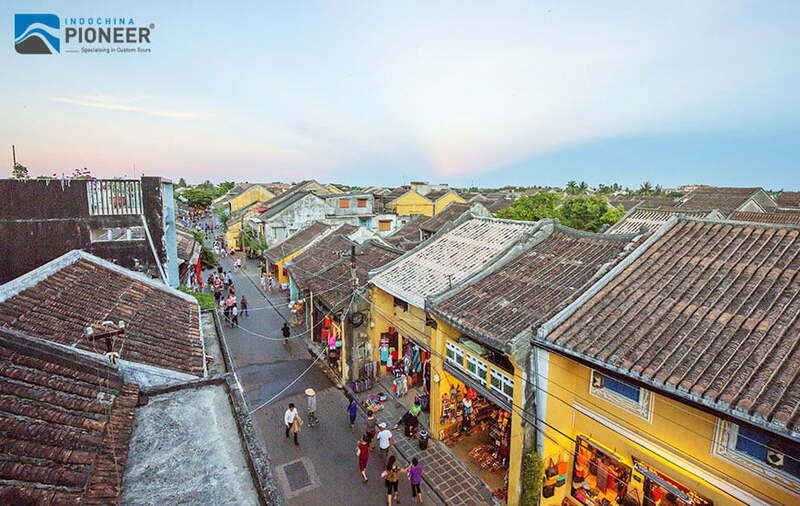 This makes Hoi An a town that clusters a cultural legacy similar to much bigger and populated cities. After some time being forgotten, this town has come back as an important tourist destination and in 1999 it was listed as a World Heritage Site. Fortunately, its architecture and lifestyle haven’t really changed from those in the past. Later, you will have lunch in a local restaurant and, back in the hotel, you will have the rest of the day free so you can discover this fascinating place at your own pace. You can rest or go to the beach maybe. 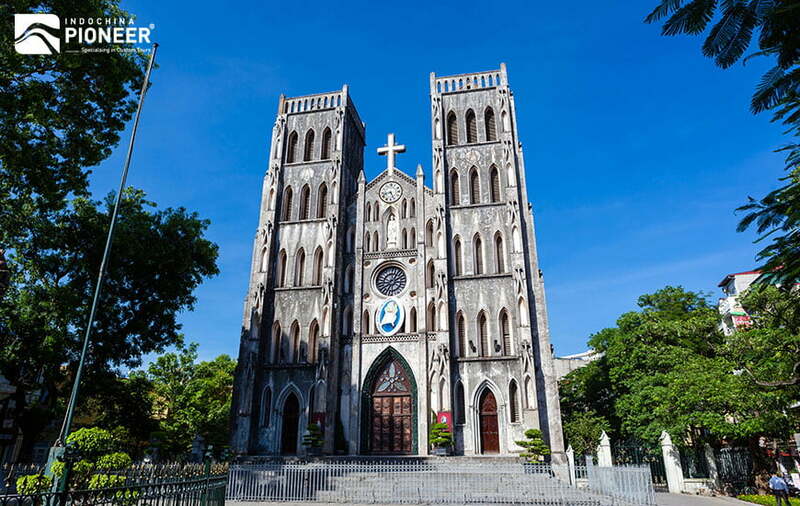 After having breakfast in the hotel, you will do a road trip to Hue, passing by the city of Da Nang. Along the way, you will go through the splendid landscapes offered by the Hai Van Mountain Pass – “ocean of clouds” – geographical border between North and South Vietnam. You will stop by the beautiful Non Nuoc beach and the Cham Museum, home to the best sculpture collection of this ethnic minority people (Cham) in the whole country. 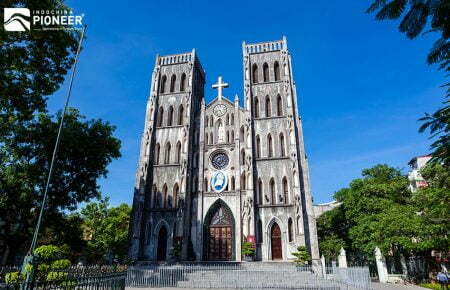 In Da Nang you will have the chance to visit the Marble Mountains, an impressive range of five sacred hills where some Buddhist shrines can be found. 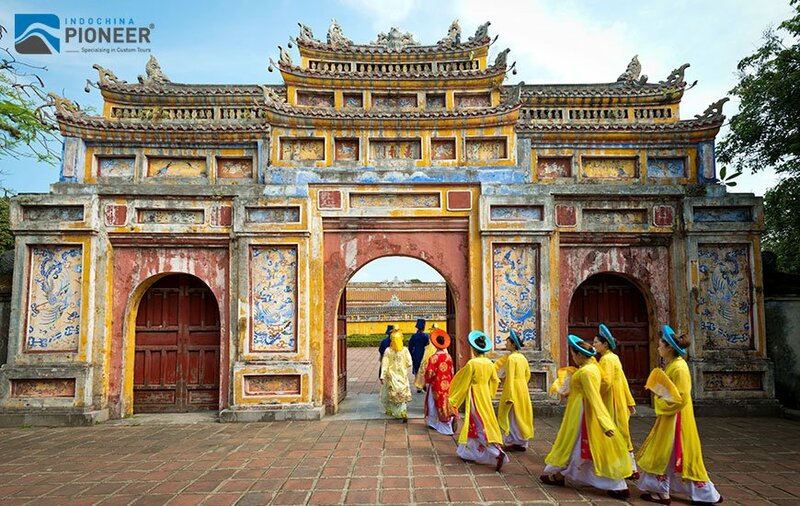 In the end, you will reach the city of Hue, former imperial capital of the Nguyen dynasty, located on the banks of the Perfume River and considered one of the most relevant cultural and historical centers in Vietnam. 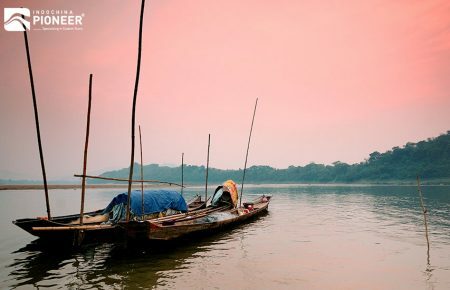 After breakfast in your hotel, you will go aboard a boat to sail through the evocative Perfume River. During the boat ride, you will stop to visit one of the main religious spots of the city: the Thien Mu pagoda (“heavenly lady”). 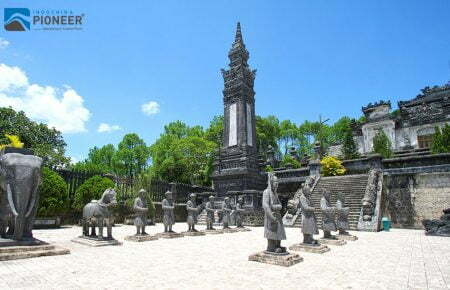 It is a symbol of Hue and Vietnam, with its 21-meter tall tower set up with seven octagonal floors. 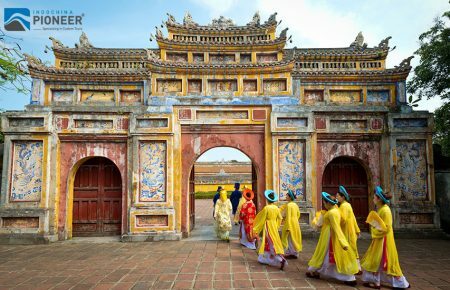 Following this, you will visit the Emperor Tu Duc’s Mausoleum and the magnificent Imperial Citadel, house of the Nguyen dynasty between the nineteenth and twentieth centuries. This fortress has three concentric enclosures – the Civic City, the Imperial City and the Purple Forbidden City – a mixture of the Chinese oriental precepts and the French military principles that result in a combination of beautiful palaces, temples, walls and bastions. You will eat, after, in a local restaurant and go to the hotel. 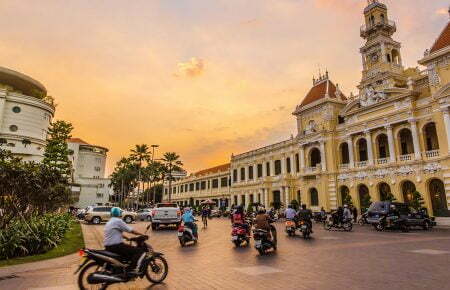 After breakfast in your hotel, you will get transferred to the airport for a short flight to Saigon – former name of Ho Chi Minh City that most of the people still use. When you arrive there, your tour guide will take you on a tour around this dynamic city, considered the most important in the south of Vietnam. The tour starts in the History Museum, former Presidential Palace, from where you will walk – or go by car if you prefer – to visit the main monuments from the colonial times: the former Central Post Office, one of the most attractive buildings in Saigon, designed by the famous French architect Gustave Eiffel in 1886-1891; the Town Hall – in French “Hotel the Ville”-; the old Opera Theatre, a great colonial construction; and Dong Khoi street, the main commercial street in the ancient colonial Saigon – known back then as Rue Catinat. Next, you will enjoy your lunch in a local restaurant and go back to the hotel. The rest of the day is free to do whatever you want. 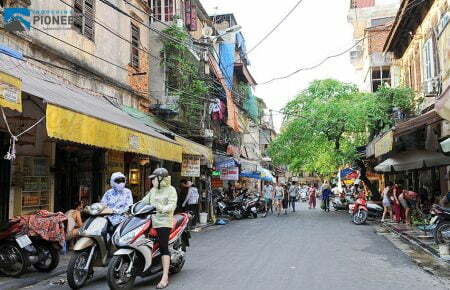 It may be a good time to visit Cholon neighborhood – Saigon’s China Town – where you will find fantastic places such as Binh Tay market. You shouldn’t miss the iconic Thien Hau pagoda, build by a Cantonese congregation to honor this goddess, or Ben Than market, where the vendors sell a huge range of different products and handicrafts. After breakfast in the hotel, you will go by car from HCMC to My Tho, gateway of the Mekong Delta. This locality, important commercial place in the area, was founded in the seventeenth century by Chinese refugees running away from Taiwan. 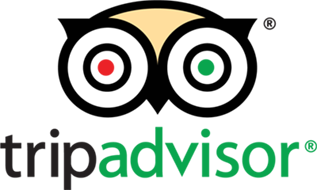 With its economy bases in fruit and rice cultivation and fishing, it will be our starting point. Upon your arrival, you will take a boat to enjoy a relaxing ride on the river Tien and cross to the other side, to an area known as Ben Tre. 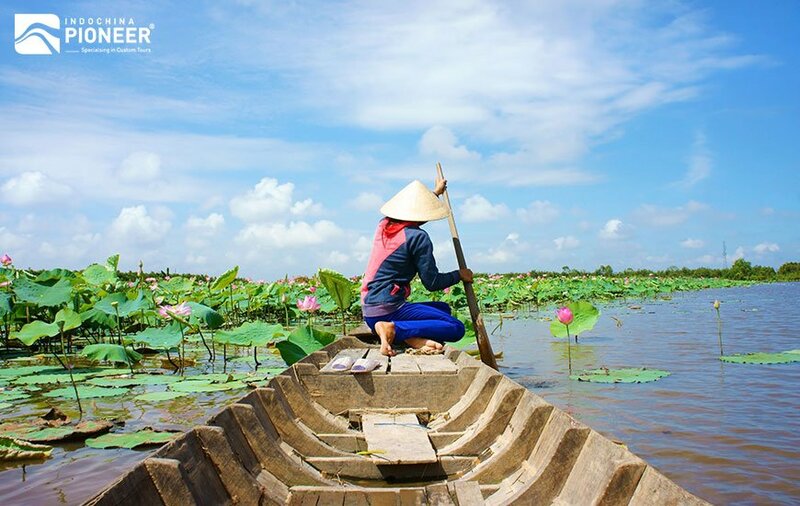 On the way there, you will visit a fish farm and the fish market, followed by a stop in Mr. Ba Chi’s farm where you can enjoy his seasonal fruit and listen to traditional Vietnamese music. Right after, you board the boat again to reach Tan Thach and witness the process of coconut sweet making (keo dua), very popular in this region. You will also take a ride on a horse-drawn carriage and visit the village local market. Another boat ride will take you to Khanh, where you will learn about the people’s lifestyle while you walk under the coconut trees shade. When you cross the Monkey Bridge, you will reach Vuon Dau. You will have lunch there, after which you will take a rowing boat to sail through the canals flanked by palm trees. 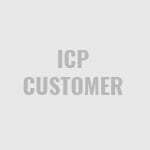 You will go to the city of My Tho and get transferred to HCM City and, later, to the hotel. Today you take your short flight to Bangkok. Arrive to Bangkok, get welcome and transferred to your hotel in the city center. Enjoy your time of leisure. Enjoy a full–day excursion from Bangkok to the legendary DamnoenSaduak Floating Market, located approximately 65 miles (110 kilometers) west of the Thai capital. Your journey commences with a leisurely and scenic drive through rice paddies and salt fields. En route, visit a farmhouse and watch locals producing sugar from the coconut. 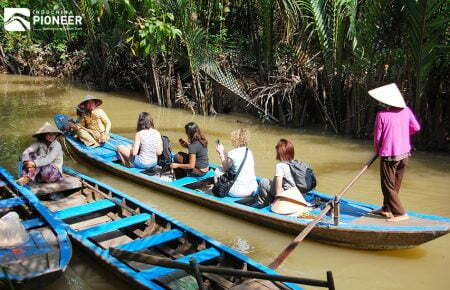 The tour then continues by boat, passing fruit plantations and Thai houses that reveal a more traditional way of life. Upon arrival at Damnoen Saduak Floating Market, discover boats of all different shapes and sizes, still used by local merchants to ferry their goods along this Venice of the East. 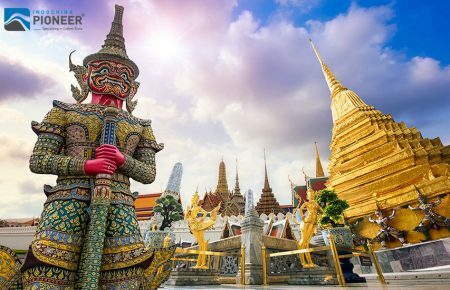 Having immersed yourself in the eclectic environment, head back towards Bangkok, stopping at a wood–carving factory en route. After lunch, visit the home of the Kings of Siam of the Chakri Dynasty in the heart of Bangkok. Originally built by King Rama I, and serving as a royal residence until 1946, today the palace is used for visiting royalty or special guests of the Kingdom. 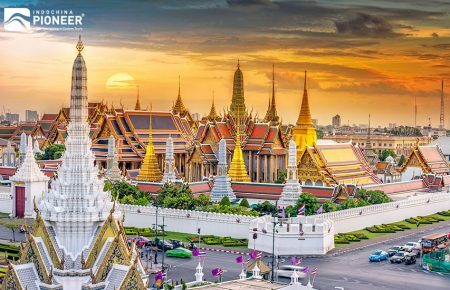 Adjoining the Grand Palace, admire the Temple of the Emerald Buddha (WatPhraKeo), the best known of the royal temples, and regarded as the most important temple in all of Thailand. It is used for numerous religious ceremonies in which the King participates, especially at the beginning of each of the 3 seasons when the king personally changes the elaborate robes of the Buddha image, carved out of a single piece of emerald–green jasper. After breakfast in the hotel you will have free time. 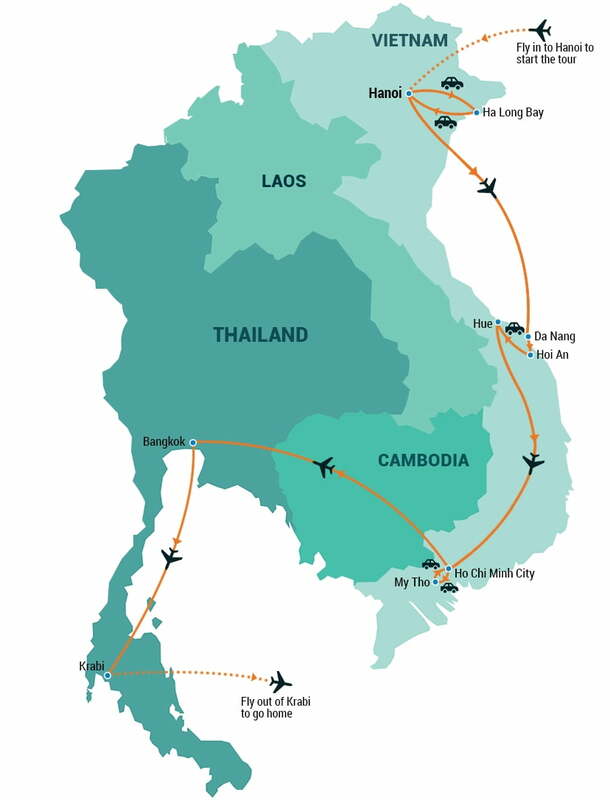 At the appointed time, you will go to the HCMC airport to take a place to Krabi, a city located in the south of Thailand by the Andaman sea. Once you land there, you will be transferred to your hotel. 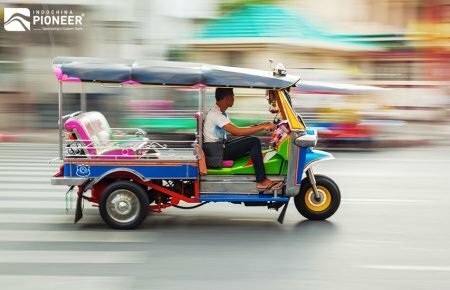 Located on the western side of Mae Nam Krabi, about 1000 km away from Bangkok and 180 km from Phuket, this town offers a lot of attractive activities worth its discovery. Actually, the river here is surrounded by lush mangroves and in the northern part of town you can find the twin limestone mountains of Khao Khanap, majestically rising from the water. The town of Krabi is as well a popular touristic destination and an important stop for all the ferries that link to the surrounding islands. In the night, you cannot miss the bustling night market located on Khong Kha dock, where you will find many options for having dinner. Free day for you to discover all what Krabi has to offer. 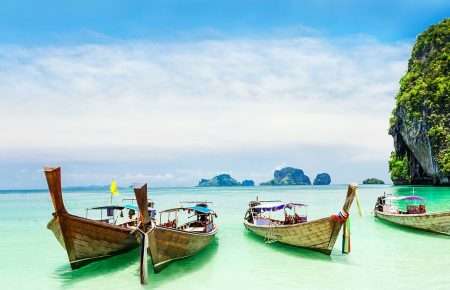 Something you must do is an excursion to the beautiful Phi Phi islands. You can book a cruise to do that in the neighboring Ao Nang town. In Phi Phi Lei you will find the Viking Cave, a gorgeous cave that leads to the sea without passing through any beach. This grotto takes its name from a pirate ship painted on its walls. Inside you will be able to admire many terns’ nests. 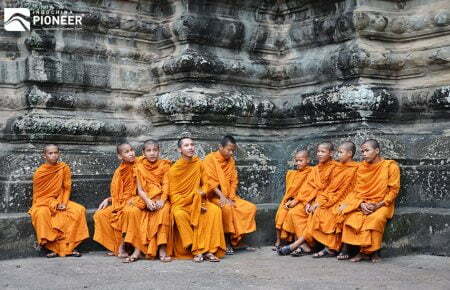 It is also worthy visiting the fascinating Khao Phanom Bencha National Park. This protected area has amazing waterfalls, such as the eleven-tiered Nam Tok Huay To. Not far from there you can fall in love with Nam Tok Huay and Nam Tok Khlong Haeng cascades, just as impressive. In this place, you can see clouded leopards, tigers, Asian black bears, tapirs, gibbons and many different tropical birds. Also, on your way to the park you can observe Tham Khao Pheing, a cave filled with stalactites and stalagmites. Another must visit is the Marine Fossil Graveyard, located in Ban Laem Pho cape and only 16 km away from Krabi. This astonishing place contains huge rock blocks that have been formed throughout the last 35 million years with marine fossils. During our last to last day of this trip, you will enjoy another free day to learn more about Krabi and its surroundings. You may want to go visit Koh Lanta, located about 70 km south of the town. This district is made of some small islands and two main ones: the biggest and most populated, Ko Lanta Yai, commonly known as Ko Lanta; and the smallest one, Ko Lanta Noi. The Koh Lanta Marine National Park is located there, founded in 1990. One of the most beautiful spots is Koh Rok Nai, with its bay in the shape of a waning moon, its cliffs, coral reefs and white sand beaches. In Koh Talabeng you can also admire some extraordinary limestone caves. 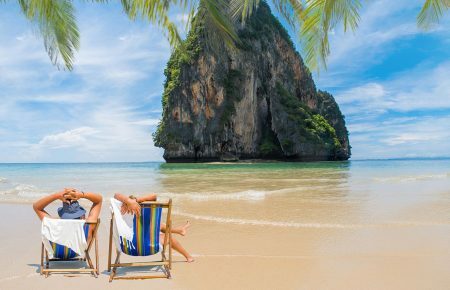 In the other hand, it is as well very advisable to go to Railay (or Rai Leh), near Ao Nang, where you will see the iconic limestone rocks of Krabi province. That place, still not very popular among tourists, allows you to do scuba diving, snorkelling, rock climbing – there are more than 700 climbing routes -, kayaking o simply relaxing on beaches such as Hay Rai Leh or Hat Rai Leh East (this one is surrounded by mangroves and has some bars and restaurants). All good things must come to an end and after almost two weeks going all over Vietnam and the Thai province of Krabi, it is time to pack your things and return home. 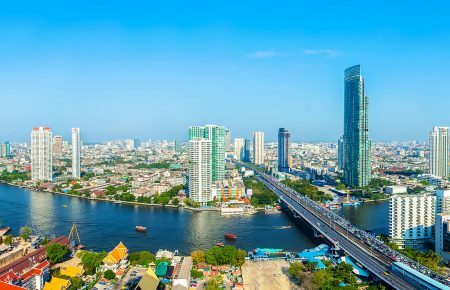 At the appointed time, you will get transferred to the airport to take a flight back to Bangkok and then transfer via your International flight home.